Women have faced inequality in the workforce since the late pre-industrial period and it grew during the Industrial Revolution. Today, women in the workplace face a Glass Ceiling which stops them from reaching the highest ranks of their chosen professions. Since the early 1990s, the percentage of women who are employed has steadily increased. In 2009, 58.3% of women worked, this is almost double the number of women who were employed according to the 1976 census. In addition, the effects of the economic downturn were less severe for women then they were for men and this is consistent with the results of the last two recessions. (Ferrao 1) Despite these gains for women, there has been no corresponding improvement in the number of women advancing to executive rank in our largest companies. Eichler states in her report that the reason for this is that some men in senior management still believe that women are not qualified for executive positions, however, Canadian statistics prove that this is not true! More women than men enroll in college and university programs and these women are less likely to drop out before completing their programs. Although it is not the recent college or university graduates who make up senior management, these women have had the training and the knowledge to qualify for these positions, should the opportunity arise for them. 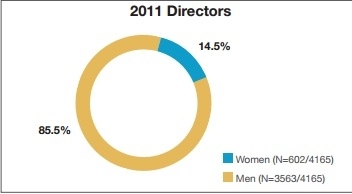 Despite this, women are still extremely underrepresented in boardrooms and in executive positions in Canada. Another problem women face is that often board positions are chosen from the inner circle of senior management and if women are not there, they are not able to be chosen. The government is trying to prevent this inequality in the work place by initiating the employment equity act. This act is partly administered by the Human Resources and Skills Development Canada’s Labour program and it requires that federal public service, Crown corporations, federal contractors and the federally regulated private sector identifies and eliminates employment barriers for women, Aboriginal people, persons with disabilities and members of visible minorities. (HRSDC 1) This act makes it more difficult for these groups to be discriminated against when looking to be hired. Regulated companies have to meet negotiated equity criteria. This act helps women enter the workforce, but more needs to be done with the upper management positions for women to meet their full potential and ability within the workforce. The situtaion needs to change and men need to step up and ensure women’s full participation in the boardrooms of Canada. A balanced boardroom with equal numbers of men and women will only help the company become better and stronger. More diverse boards are better for business.